What is Data Free Streaming? I’m still undecided and need more information on the available plans. If there is one thing you should take away from reading this article it is that you should never again buy a phone under contract from a phone company. Our analysis of the cost of data shows that it is declining 50% per year. That means if you are stuck in a contract you will miss out on a lot of cheap data during the 2 years of your tenure. Competition between the phone companies causes this ‘data price deflation’. 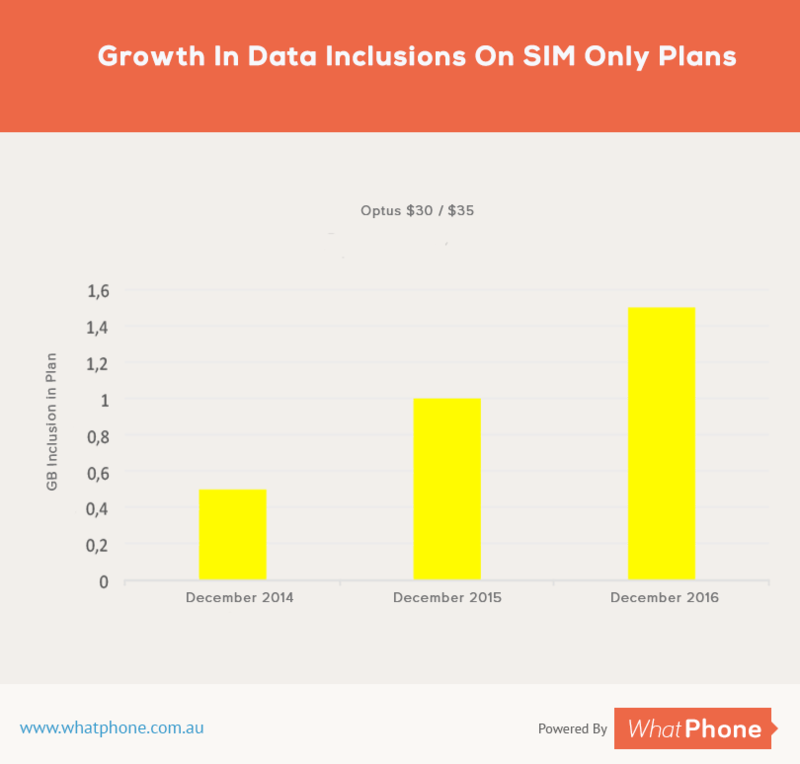 And enjoy the ride – because, as we show in the summary, there could well be more of the same data price reductions on the way. But remember, while the price is falling, your usage is increasing. That means unless you move plans, you could end up paying more! What is ‘data price deflation’ ? One way of describing a consistent, general decrease in the cost of data is ‘data price deflation’. The phenomenon is especially prominent on prepaid plans although all non contract agreements with your phone company benefit. The reason it’s these plans more than any others that benefit is not hard to see: They are month to month agreements. Users are free to move from them, to a better deal (with more data) whenever they want to. They can even change phone service provider if they need to, in order to secure the deal. How quickly does the price of data fall ? The price of data is falling at a rate of approximately 50% per year. That means if you got 1GB of data included in your $30 plan a year ago, you are likely to get approximately 2GB for a $30 spend this year. Data price deflation applies to all networks. Telstra’s pricing falls at the same rate as Optus’ or Vodafone’s. This is not a recent effect. Data price reductions have been happening for at least the last 5 years. In fact, I remember when I used to work on BlackBerry in the UK in 2005 and the average usage was 1MB per person! That was 10 years ago. Average usage of 1GB per person now (which is not far from the truth) would be a doubling of included data, every year, for 10 years. Whether you are spending $30 per month or $150 per month, you will be affected by data price deflation. What’s the danger of this data price falling so precipitously? Remember, if you don’t manage your plan, if you don’t move to a new phone plan, your usage will increase on a plan with expensive data – and that’s when you’ll pay through the nose. If the price of data is falling so fast, how come the phone companies haven’t gone out of business ? Good question. The answer is your usage. Several influences are driving the amount of data you use up at about the same speed the price is coming down. Your usage is increasing at between 50% per year and 100% per year. If you used 1GB last year, the chances are you’re going to use 2GB this year. There are many reasons for this: Your familiarity with and reliance on your phone. The speed the data comes down to the phone. The speed of the phone’s processor and it’s ability to interpret and present the data which has been sent. One of the costs which is hard for you to anticipate is the charges you will incur for the data you use at the end of your agreement. Statistically, (i.e. if you’re like most people) it’s going to be a lot more than when you started. Net net, if you manage your plan, your spend is probably about the same per month as it was 5 years ago. You’re just getting more data for your money. But remember, if you don’t manage your plan, if you don’t move to a new phone plan, your usage will increase on a plan with expensive data – and that’s when you’ll pay through the nose. What causes the price of data in phone plans to fall so quickly ? A number of factors combine to cause the price of data to decrease over time. The availability (supply) of ready substitutes from other phone companies is the primary item driving the ongoing decreases in the price of data. The 4G data networks from Optus, Telstra and Vodafone cover almost identical proportions of the population now. Using OpenSignal’s Optus’ 4G network is available to people 90.5% of the time. Vodafone’s is available 88.48% and Telstra’s is available 88.06% To the average person, there is no discernable difference in the amount of time or the number of locations they will receive a 4G signal between Optus, Telstra or Vodafone. That means that as soon as a better deal on data comes out on a different network, they may as well move across to get it. There are an ever growing range of smaller phone companies available which resell the networks above. Smaller phone companies almost always target a specific customer base (for example, older people or people who love a particular type of sport) and aim to service that group. Their hope is that they will meet the needs of the segment better than the ‘one size fits all’ telcos. This can lead to some incredible data offers. Take Boost Mobile for example, who offer extra data on the weekend or OVO Mobile who provide huge data allowances and include free streaming video of content appropriate to their audience. 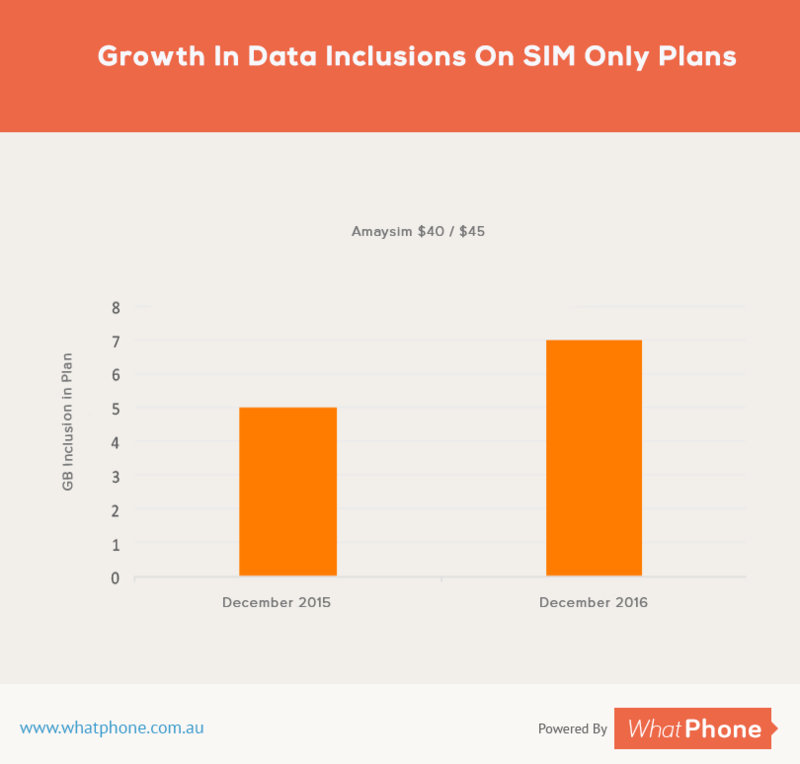 Prepaid has always been more than 40% of the market in Australia. We have seen the number of prepaid SIMs explode on this site in recent years. The nature of the prepaid market is that it is filled with special offers and bonus data deals to lure you away from your existing phone company. They have to do that because there are no contracts around. In time, we suspect that the whole SIM market will look like prepaid does when it comes to offers. While not yet something which is affecting Australia greatly, leasing could, at some point, come to these shores and accentuate the reductions in the price of data that we are already seeing. The only reason people take a contract is to get a phone which is ‘free’. ( As you know it was never free, they don’t even describe it as free, they describe it as $0 upfront because they charge you for the phone in the contract plan!) Leasing allows you to get the same $0 upfront deal and pay someone other than the phone company for the device. That leaves you, the user, to move your SIM whenever you want to. We’ve seen Telstra launch one of these schemes recently down here and a major provider take it to market in the UK. We hope it comes to Australia because it would really mix things up. What does the falling price of data mean to you ? If there is a single thing you should take from this article, it is that you should not sign a phone contract agreement with a phone company ever again. The ramifications, to normal shoppers, of this constant reduction in the price of data, are quite clear. If there is a single thing you should take from this article, it is that you should not sign a phone contract agreement with a phone company ever again. Buying the phone yourself and adding a SIM could already save you 25% over the course of life of the contract as we show on our article on the subject. from a small phone company ? If you’re out of contract, that’s great. But with great power, comes great responsibility. You should check around to see if there is a better deal at least every 6 months. And when you do, we suggest you ….. It takes a total of 8 pieces of information to be able to change your prepaid service. It’s a 10 minute job and your browser’s auto complete will do half the work for you. Most SIMs are delivered next business day now and changing them over is a breeze. If you didn’t know you could keep your old phone number, well, you do now. If you want the benefit of falling data charges, you have to be prepared to move (plan or company) to get them. Phone companies have started investing in extras like free streaming audio. In some cases, you will even get free streamed video (like to what is SVOD.) Either of these services can save you more than just a few GB of data. They provide peace of mind and a factor which differentiates beyond the core plan headlines. 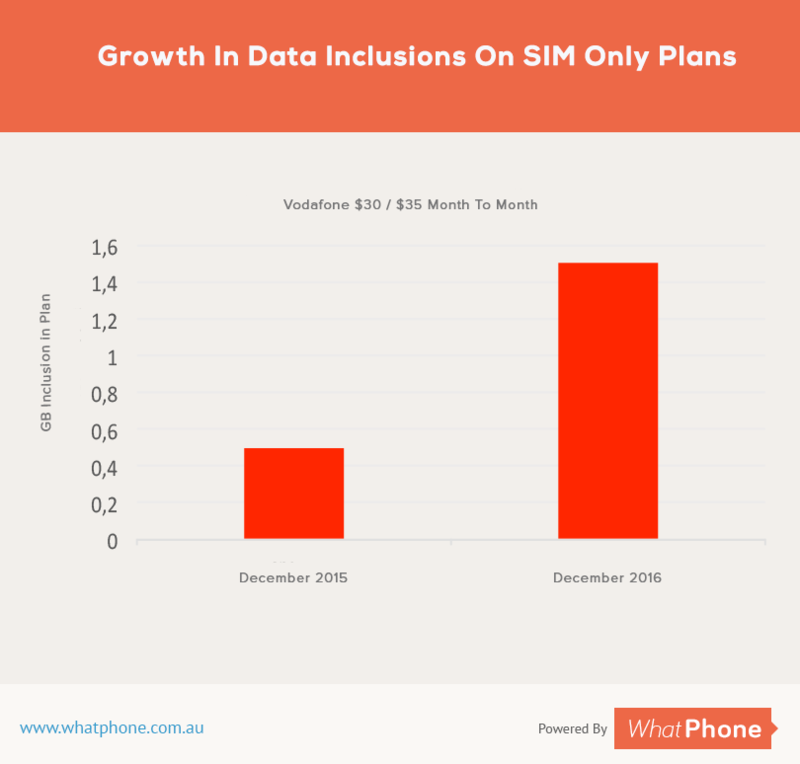 Without doubt, it’s data price deflation which is driving the uptake of buy your phone outright, add a plan which is what around 50% of Australians now do. The sheer volume of factors working against the phone companies (almost) makes us feel sorry for them. The numbers, when you look at the infographics we’ve produced, are stark. The cost of data has fallen 50% year on year since sales of 4G services began. There are few businesses which can say that they have had to reduce the retail price of their product 50% every year. All in all, data price wars, while useful are, in their own way, a shame. Ever reducing prices for a GB of data do not really address some of the structural problems that the telcos could, otherwise, be looking at. Cheaper data doesn’t make up for poor customer service – when you get bounced around departments trying to solve a simple problem. It doesn’t improve coverage in your area. It doesn’t make up for the fact that your telco closed the phone shop near where you work. It’s good for the what consumers have to pay, though. Faced with price cutting from Vodafone, designed to recover from their network woes 5 years ago, Optus and Telstra have had no alternative but to match data pricing. They’ve also tried to react more intelligently to put a stop to this ‘race to the bottom.’ This circumstance is likely the reason causing Optus and, to a lesser degree, Telstra, to invest in entertainment / content services. Without doubt, it’s data price deflation which is driving the uptake of buy your phone outright, add a plan which is what around 50% of Australians now do. 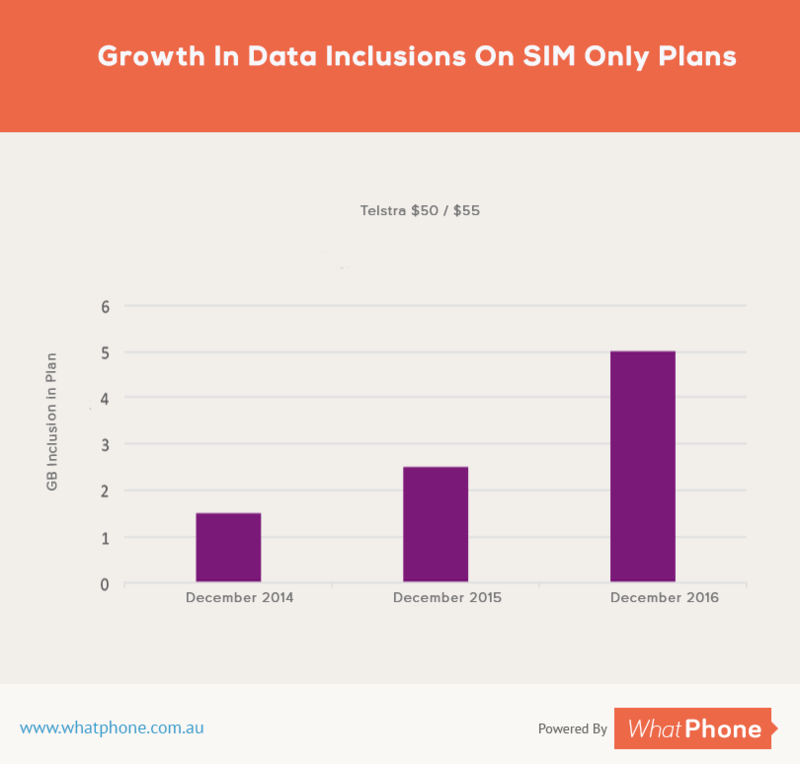 That percentage seems likely to increase in the near term with small phone companies chipping at the endges of the Optus, Telstra and Vodafone’s market share with their own, segment focused, data offers. The worrying news for the big phone companies is that this could all get worse for them. If phone leasing schemes start in Australia ( they have already started in the USA ) telcos’ contractual grip on their customer base could become even harder to maintain. The whole market ends up looking like prepaid if they’re not careful, with endless offers around and customers constantly churning. Longer term, 5G is going to have ‘infinite’ capacity so this problem of ‘what’s a GB worth’ is only going to get worse, as we have covered elsewhere. Having worked in 3 countries for 4 telcos on both voice and data products, Neil is in a position to give you the inside track. Get beyond the marketing messages to the best plan for you. How Much Data Do I Need In My Phone Plan? What Is RCS – The Replacement For SMS?